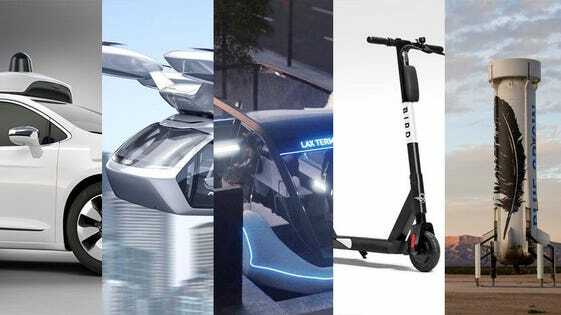 As we enter 2019, we wanted to take a moment to discuss some of the hottest transportation technologies and assess their prospects for the coming year. Will autonomous cars finally become ubiquitous? Will flying cars become a reality? Will tunnel-based transit systems dig in or collapse? Will electric scooters survive an onslaught of controversy? Will private space companies launch civilians into orbit? Here are a few predictions on what the future holds for these innovations. Self-driving vehicles are quickly becoming a commercial reality. Nearly all the major automotive companies are developing autonomous vehicle concepts in-house or have partnered with technology vendors to compete in the space. Meanwhile, a growing number of cities have approved autonomous vehicle pilot programs, further accelerating time to market. Although there are a number of regulatory, ethical and technological questions that need to be answered before autonomous cars take over the streets of America, there is no doubt that self-driving technologies are coming—and will be here to stay once they arrive. The potential for vehicular autonomy to transform the way we interact and even the way we work is undeniable. We expect 2019 to be a critical transition year for autonomous vehicles that will see the technology move from the research and development phase to the early stages of commercialization. By the end of 2020, don’t be surprised if autonomous cars are delivering transit-as-a-service in select cities, neighborhoods, parks and theme parks. While the value-creating potential of autonomous Vertical Takeoff and Landing (VTOL) vehicles is tremendous, the buzz around this transportation trend is currently outpacing feasibility. The technology behind VTOL taxis continues to advance at a rapid pace, driven in large part by major players like Uber, Boeing, Airbus, Bell and Volkswagen. The challenge to flying cars, however, is logistical not technological. After all, piloted and un-piloted VTOL technologies have been available to the military (e.g. Harrier and Lightning fighter jets) and consumers (e.g. consumer drones) for some time. Where will these vehicles takeoff from and land? What kind of airspace do they need? What patterns will they travel in? How much will they cost? How will companies ensure passenger safety? Before flying cars become a commercial reality, these critical questions will have to be answered and the infrastructure for midrange airborne transit will have to be built. We think that commercial VTOL transit will have an important and enduring role to play in the future of transportation. Unfortunately, that future is unlikely to materialize in 2019 and still be several years away. Elon Musk’s pet project, The Boring Company, has quickly made waves with a number of potentially transformative but highly speculative proposals for tunnel-based transit systems. From the Hyperloop to the Chicago Express Loop to the Los Angeles car tunnels, The Boring Company is advancing a number of infrastructure innovations that rely on subterranean pathways. While the company’s ideas are often criticized as unproven at best an unrealistic at worst, its recently unveiled test tunnels in Los Angeles show that the company is willing to invest in its vision. This is significant given how expensive and time consuming tunneling is (just ask New York’s MTA). Nevertheless, the ride through these tunnels is reported to be uncomfortable and the projected budget for the Express Loop in Chicago is reported to be unachievable. Make no mistake, underground tunnels can greatly increase transportation efficiency by unlocking an additional dimensional plane for transportation. Today, much of our transit occurs on a single dimensional plane: surface roads and rails. Like airborne transit options, subterranean systems can help change this paradigm, but innovative tunnel technologies—and the companies behind them—have a ways to go before they’re ready for universal adoption. Novel tunnel-based approaches will come to fruition, perhaps within the next five years. Whether or not The Boring Company will be the one to do it, however, remains to be seen. Electric scooter services from companies like Bird, Lime, Spin, Skip and others have stirred up controversy in cities around the country, precipitating a number of lawsuits. The phenomenon of haphazardly parked scooters obstructing sidewalks and streets, and un-helmeted riders zipping quickly in and out of traffic, demonstrates why new modes of transportation need corresponding infrastructure systems that can accommodate them without disrupting other modes of transportation (think bike and bus lanes). The absence of a dedicated lane or thoroughfare has contributed to the disorder that e-scooters are often criticized for. It also makes electric scooters qualitatively different than Uber and Lyft (both of which have also entered the scooter game). Ride sharing services like these used existing road infrastructure in a new way, but didn’t interfere with pedestrians on sidewalks or bikers in bike lanes. Additionally, while enjoyable to ride, scooters are more useful in certain cities and neighborhoods than others. In cities with climates that deter outdoor activity and those with relatively small or diffuse shopping and entertainment districts, the benefits of scooters are greatly reduced. Given their lack of universal value and the lack of dedicated infrastructure, we expect scooter mania to plateau—but certainly not go away—in 2019. Although space travel is typically not considered a part of the overall transportation mix, companies like SpaceX, Blue Origin, Virgin Galactic and others are putting the stars within reach of private citizens. As the commercialization of low earth orbit and deep space accelerates, space transportation will become a viable mode of transportation—if only for the entertainment of the wealthy at first. SpaceX and Virgin Galactic in particular are taking aggressive steps to be the first to send paying customers into orbit and beyond. Although there’s a lot of excitement around the new space race, all of these companies have a lot of work to do before they can send ordinary civilians (versus highly trained astronauts) into space and bring them home safely. There are also numerous infrastructural systems that need to be developed and perfected before commercial space flight can exist in any meaningful and sustainable form. 2019 will undoubtedly see the private space industry make huge strides. That said, most of us shouldn’t expect to be looking down on Planet Earth from orbit anytime soon. Technologies like the 5 aforementioned innovations are bringing much needed attention to a stagnant transportation industry. Beyond moving people and goods from place to place, our transit systems mitigate time and distance, and bring us all closer together. The transformation of transportation is a must if we are to remain a united and prosperous society. While not all of the technologies discussed here will breakthrough in 2019, let’s hope that the disruption of transportation continues in the coming year.